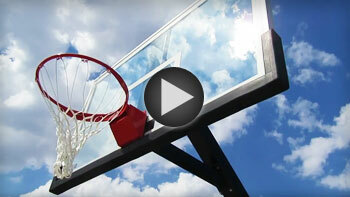 The Highlight Hoops HIL885-XXL is the boasts the highest rigidity rating of any basketball system. This massive system starts out with a 6-bolt anchor post that measures 8"x8" square, with 7 gauge post thickness. This post is as stiff as a brick wall. The fixed extension arm is clamped to the post using stainless steel hardware and positions the backboard an astounding 5' in front of the post. So whether you are going in full steam on a layup or boxing out strong under the board, there is plenty of room to maneuver without risk of player contact with the post. Free safety padding for the post and backboard are also included. The 42" tall x 72" wide x 1/2" thick tempered glass backboard is identical to the ones used in the NBA and NCAA. Our breakaway rim is indestructible and will give you decades of dependable use. And remember, all steel components are run through our WeatherShield galvanizing rust free undercoat treatment before painting so your basketball unit will look fresh and new year after year. 1/2" Thick Tempered Glass Backboard: 42" tall x 72" wide x 1/2" thick tempered glass, same as the pros play on. 60" Offset from Backboard to Post: Helps avoid player contact with the post during aggressive play. Heavy Duty Post: 8”x8” 7 gauge square pole is extra rigid for performance that is true to the game. Bolt-down Installation: The post uses our six bolt anchor which make installation and relocation if you move easy. WeatherShield Rust Protection: All steel components are treated with a zinc galvanized undercoat to prevent rust. Powder Coat Protection: Each unit has black powder coat paint for a superior weather resistance and good looks. Safety Padding: Super thick post pads and backboard pads are included at no extra charge. Stainless Steel Assembly Bolts: All assembly bolts are stainless steel to prevent corrosion.